Thick, rich, and vegan! 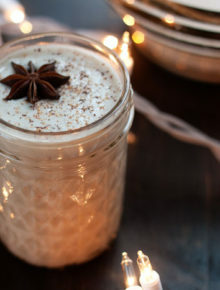 Eggnog x chai spices = a perfect combination. 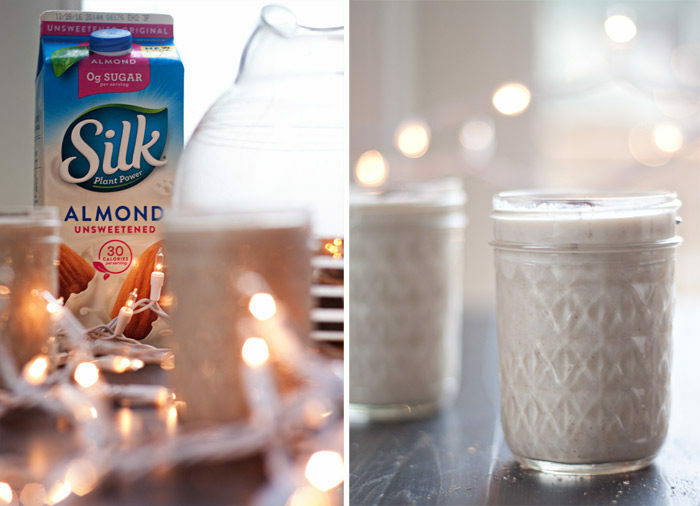 I love this eggnog straight up or as a coffee creamer – and I sip it all December long. This post is sponsored by Silk. This year, I partnered with Silk to create and share monthly ideas and recipes celebrating an Earth-friendly, plant-based diet and life – something I’m personally moving more and more toward. 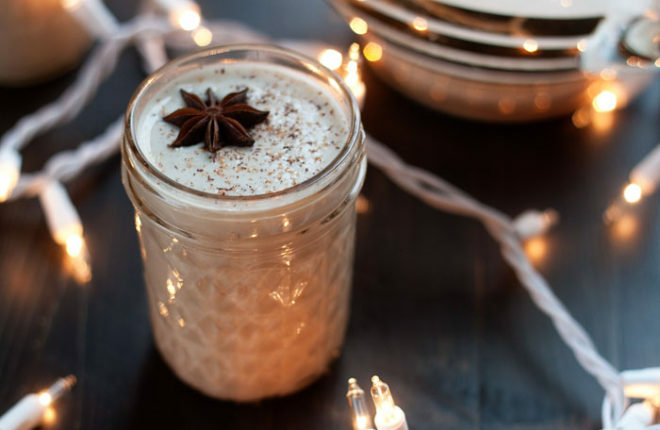 Growing up, we knew egg nog existed, but never actually laid our lips on it. Our Dad was vehement that eggs should never, ever, be in a liquid state. Custard? Weird. Over easy? Unthinkable. Egg nog? Criminal. I agreed with him up until early adulthood, when I discovered the beauty of a perfectly poached egg. Holy-what-have-I-been-missing-ness! But the idea of straight-up raw eggs in something? Yeah, still skeeved me out a bit. So even though I enjoyed my fair share of eggnog lattes as a young adult- I guess I was far enough removed from the egg to be okay with them – a cold glassful of simply eggnog just really didn’t appeal to me. So so so SO good. I made and tweaked and made and tweaked that recipe more my fair share of times last December, and for the past four months, I’d be lying if I said I haven’t looked forward to vegan eggnog season almost daily. Because seriously, this is a case in which plant-based beats the plants – er, the pants – off of the original dairy-and-egg version. 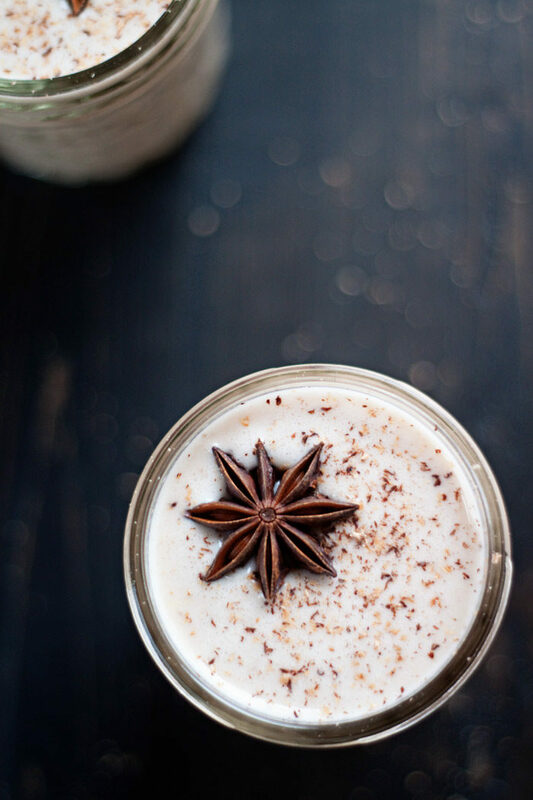 My favorite iteration of the recipe is this Chai-Spiced Vegan Eggnog, flavored not only with must-have nutmeg, but also some ginger, cardamom, cinnamon, and spicy peppercorns. And a star anise for good measure. The inspiration recipe started with cashews, which I love. But I thought I’d try to make an easier version, one that starts with Silk Almondmilk and doesn’t need the lead time that soaked cashews call for. (I also like that using almond milk instead of cashews lightens up the recipe a bit). First, we simmer the almond milk and coconut milk with the spices to infuse in all of that chai-spiced goodness. Then, we add a goodly bit of vanilla and blend it all up with several medjool dates. I find that dates are key to this recipe – they add a richness, thickness, and caramelly flavor. YUM. Chill and serve it up with a generous dusting of more nutmeg and maybe even some rum if you’re so inclined. 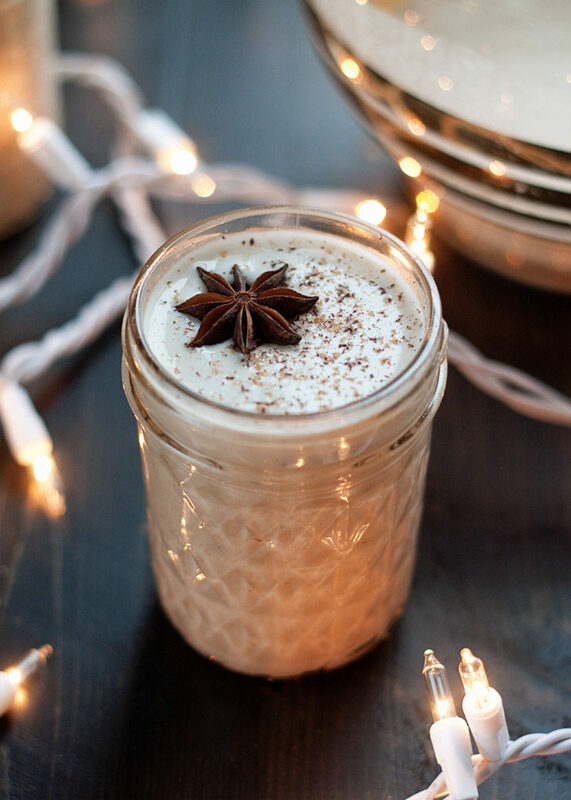 It tastes decadent as an evening cocktail, but this vegan eggnog recipe also makes a most excellent coffee creamer the next morning too. You can bet I’ll be enjoying it both ways right up until Christmas. And, to be honest, well beyond as well. And Dad would approve, so, bonus! Grab your spices in the bulk section of your grocery store. You’ll be amazed by how much you save! Place a medium saucepan over medium-low heat. Add the almondmilk, coconut milk, nutmeg, cinnamon, ginger, peppercorns, cardamom, star anise, and turmeric if using. Bring to just a simmer, then remove from heat. Stir and cover. Let steep for 20 minutes. Set a fine-mesh sieve over the pitcher of a high-speed blender. Pour milk mixture through the strainer and discard the solids. Add 6 dates, vanilla, and salt. Blend until completely smooth, 1-2 minutes. Taste and add the remaining date if you’d like it a little sweeter. Pour into a container with airtight lid and refrigerate until ready to serve. The nog will thicken as it cools. Stir before serving. Serve plain either warm or chilled (your preference), with or without a splash of rum, or use in eggnog lattes or as a coffee creamer (delicious)! Be sure to grate a bit of extra nutmeg over the top. Keeps refrigerated for 3-4 days. Add about 6 ounces of chilled nog to a highball glass. Stir in an ounce of your favorite rum (if desired). Grate a bit of nutmeg over the top. Serve. Splash into coffee for a festive coffee creamer. Heat some nog on the stove top. Froth with a frother. Add a shot or two of espresso to a tall mug and pour in the eggnog. Spoon the froth over the top. Eggnog latte! Find Silk in stores and sign up for Silk’s email newsletter for great coupons and giveaways. This is a sponsored post that I created in partnership with Silk. I only work with brands I love! Thank you for supporting the brands who support Kitchen Treaty.